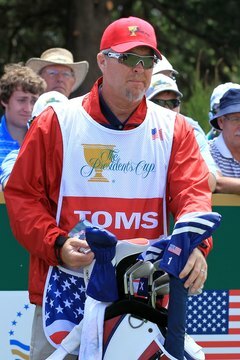 Professional caddies like Scott Gneiser, who carried David Toms' bag in the 2011 President's Cup, play a key role in their pro's success. You love golf, but maybe your strength is in reading greens and wind currents, rather than having nerves of steel with a putter in your hand and money on the line. If so, and you long to forge a career on the golf course, think about becoming a golf caddy. The successful ones who team up with top touring pros can earn six-figure incomes. Get some official training, even if you've caddied as a youngster. The Professional Caddies Association (PCA) offers training and apprenticeship programs to get you started. If you're still in school, check with golf courses in your area about caddying opportunities. Talk with caddies. Attend a tournament in your area and after a round, ask a few caddies what the job is really like. Understand that the work schedule will have you living out of hotels for about seven months a year. You'll have long days, lots of travel and pay that depends on your golfer's success. Work on your own golf game (but don't think you need to break 80) and learn the rules of golf as well as you can. And when you're out playing, think like a caddy. How would you advise a player to handle a particular lie, the wind, the pin location? Get caddying experience through part-time opportunities associated with large tournaments or scrambles in your area. See how it's done in less pressurized situations and find out if it's truly something you want to do full-time. Keep an eye out for upcoming tournaments and ask around at local courses that tend to host these kinds of events. You can often get started with no experience, as long as you have knowledge of golf and willingness to tote a bag. Keep your eyes and ears open for country club caddy jobs. Once you've gotten some experience there, start looking for pros on the developmental tours who need a hand with their bags. Consider all options, such as the LPGA, the Champions (Seniors) Tour, and even the international circuit. The PGA Tour might get the most attention and attract the most money, but there are plenty of golfers who could use a responsible caddy's help. Network like crazy. Let everyone you work for and everyone you work with know that you're looking to move up as a caddy. Stay in touch with anyone who might have a connection. Most of these jobs are filled based on referrals and relationships forged through the years, so be patient but persistent.